Men who courageously stood for what is right, women who passionately cared for those in need, Christians who sacrificed everything for what they believed, scientists who changed the world with their innovations, everyday mothers who lived extraordinary lives, statesmen who fought for freedom. . . all of these can be found in biographies. 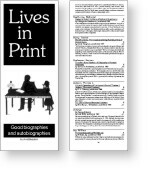 Lives in Print reviews over 150 such biographies, giving a summary of each.